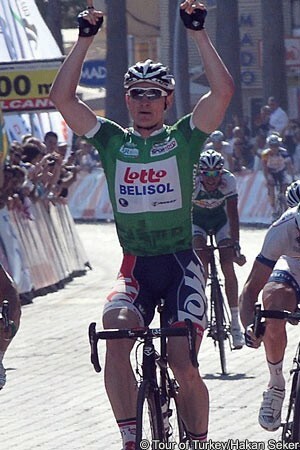 Clocking up his second sprint victory of the race, André Greipel has once again shown that he is climbing very well at present, particularly for a rider of his musculature. The Lotto Belisol rider finished in a select group into Turgutreis on Thursday, winning a gallop to the line ahead of Matteo Trentin (Omega Pharma Quick Step), Nikias Arndt (Argos Shimano) and 47 others. Speaking to the media at the post-podium press conference, Greipel spoke about the difficulty of the stage and also how he was able to remain to the fore while many other sprinters lost contact. Greipel remained well placed throughout the stage and didn’t panic when Filippo Pozzato (Lampre Merida) attacked close to the end. The Italian was eventually hauled back and, in the sprint to the line, Greipel re-enforced his points classification lead with a clear win. It marked the second day in succession that he had triumphed out of a small group. When it was suggested to him that he often used to have to rely on big leadout trains in the past, he said that he ‘had the instinct to do his own sprint,’ when it was needed. He added that he hoped that key riders from his back up would be given a green light for the Tour de France. The team is also targeting the general classification with Jurgen van den Broeck and while Greipel won three stages last year and was second in the points ranking, it is uncertain how many leadout men he will be given.